Dozens of civilians were killed when the government-held city of Mariupol in eastern Ukraine was hit by rockets on Jan. 24. OSCE observers blamed the tragedy on pro-autonomy militias, while Russia has so far maintained silence. Russian experts agree that the resumption of hostilities in the Donbass make it unlikely that sanctions against Moscow may be eased or lifted in the near future. After several weeks of increasing violence in the Donbass region of southeastern Ukraine, involving a heightened battle for the Donetsk airport and the destruction of two city buses, the shelling of the coastal city of Mariupol over the weekend, in which 30 people were reportedly killed, finally served to turn the world’s attention back to the conflict in the region, sparking fresh Western criticism of Russia for its alleged backing of pro-autonomy militias. Ukrainian President Petro Poroshenko blamed pro-autonomy militias for the attacks and cut short a visit to Saudi Arabia in order to return to Ukraine as swiftly as possible. Observers from the Organization for Security and Cooperation in Europe (OSCE) also said that the Donetsk pro-autonomy militias were responsible for the shelling. 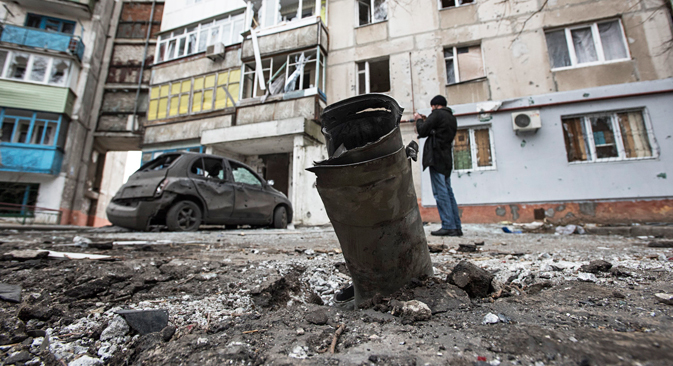 Russia, for its part, has yet to issue any official statements about the events in Mariupol. Vyacheslav Igrunov, director of the International Institute of Humanitarian and Political Research in Moscow, said that it would be impossible to avoid “double standards” in the Mariupol shelling, noting that when people were burnt alive in the Trade Union House in Odessa (on May 2, 2014), “there was in effect no reaction from the international supporters of [the pro-EU] Maidan [movement].” Their opponents act in a symmetrical way, Igrunov added. Having said that, he continued, the shelling of Mariupol will still be used against Russia. The head of the Center for Comprehensive European and International Research at Moscow’s Higher School of Economics, Timofei Bordachev, believes that a Russian reaction to the Mariupol incident will follow in due course and will be typically reserved and distanced from any of the sides in the conflict. “Russia, as is its wont, will insist on conducting an independent probe,” Bordachev told RBTH, adding that the statement made by OSCE observers immediately after the tragedy “cannot serve” as an outcome. No serious investigation has been conducted,” he explained. Alexei Arbatov warns that if the shelling of Mariupol turns out to be not a one-off incident and there is subsequently a full-scale storming of this or other cities, the West’s reaction will be very tough. “Then a new wave of sanctions will be unavoidable. Furthermore, they will be followed by such measures as arms supplies to Ukraine and a NATO military buildup in Eastern Europe, including Bulgaria and Romania,” he said. However, it is hard to understand what the militia’s plans are: “they are saying one thing today and a completely different thing the next day”, he added. Vyacheslav Igrunov concurs that any offensive mounted by militia forces is likely to be followed by a new round of sanctions. Having said that, he added, the sanctions are likely to be “soft,” since Europe is now faced with serious problems of its own, namely Greece and the threat to the euro. A further deterioration in relations with Russia would only further exacerbate Europe’s economic performance, which currently appears to be rather “vulnerable,” he said. Having said that, a new blow is more likely to come from the U.S. rather than the European Union. The business daily Kommersant, citing its sources at the U.S. State Department, writes that Washington may exclude Russia from the SWIFT banking communication system even if the Europeans refuse to do the same.